Empire is my natural first language (as I wrote in books here and here), so why am I carrying around the first book I have written exclusively about the United States at a time when we so urgently need to talk about empire? Nevertheless, it strikes me that reproductive politics might actually be a powerful way to talk about US empire, most obviously in how it relies on the work of race, nationalism, and the expansion of free market fundamentalism within the borders of the US—and hence, beyond them. 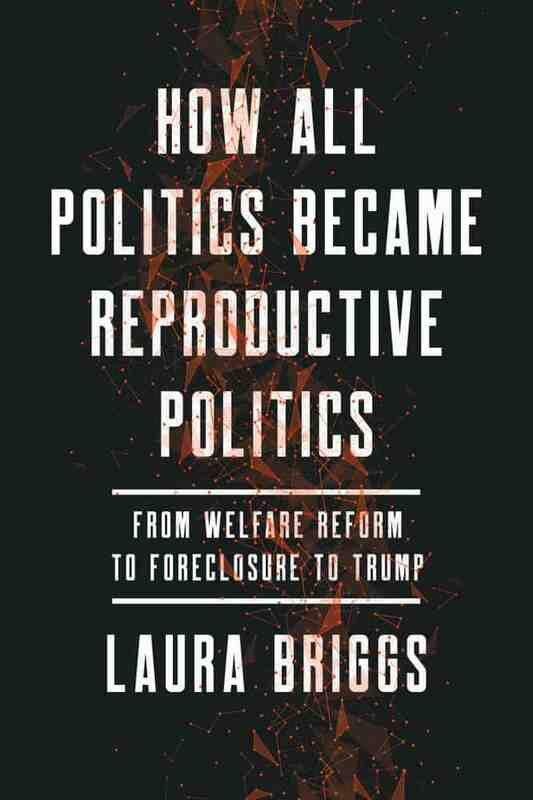 I use reproductive politics in the older, socialist feminist sense in which the domain of the “reproductive” is that which is not “productive” in the capitalist sense. Another layer of meaning comes from Black and other women of color feminists in the US like Loretta Ross who speak of “reproductive justice” as not just the politics of whether or not to have children, but also the means to raise them—housing, jobs, food systems, freedom from police brutality, high-quality schools, and the like. In the War-on-Poverty sixties, government and political movements alike agreed that it was a shared, collective responsibility to make sure that these things were available to all. That was never a promise that was kept, but the power of mid-century social movements was that they could appeal to a shared sense that government and business, alongside religious institutions and neighbors, owed this to the people of a nation. That optimistic sense of what it meant to belong to a society was taken up even more robustly by decolonization and socialist movements outside the US, with their calls for land reform, price controls for staple goods, collective child care, and state-run health care and social security. In the book, I show how the libertarian wind that blew across the country with Reagan (and Thatcher) relied centrally on a racism that was about moral disapproval of others’ families to persuade a majority of people that they not only would accept a smaller social safety net and reduced real wages for all but the top 1%, but wanted such a thing—from associating government transfer payments with (implicitly Black, explicitly immoral) “welfare mothers” to the waves of immigrant deportations that followed Clinton’s “Nannygate,” to lenders who targeted Black and immigrant women in particular for subprime mortgages, and the launching of the Tea Party movement as a claim that the Obama administration was going to bail out “losers’ mortgages” (it didn’t, but that’s another story). The foreclosure crisis was a kind of welfare reform redux, but it unabashedly took down great swathes of the middle class, not just poor folks. But of course, as the book shows, the place where the US government learned all these moves was in the Third World, where it used debt as a club to undue the kinds of expansive ways that people had imagined the relationship of its people, as structural adjustment programs that operated principally in the realm of relations of reproductive labor–closing hospitals and schools, ending food subsidies, reducing the number of government jobs, and drastically contracting the role of the state in deeply libertarian ways. These were the “reforms” that drove migrants to the US to do nanny work in the first place. They too were accomplished through racism, through a set of claims about the lazy, spendthrift Third World, and could only be secured by closing borders so that those allegedly indolent workers didn’t cross borders to get new jobs as their home economies contracted brutally. These deeply unpopular economic changes, not surprisingly, brought authoritarian rulers to power. The second conversation that the book is, I hope, contributing to, is about the work of whiteness and evangelical Christianity in producing a certain kind of highly exportable reactionary formation. Thanks to Margaret Atwood and the television series The Handmaids Tale, we can call it Gilead—an authoritarian regime that centers a white/ethno-chauvinist reproduction in nuclear families at the expense of women’s rights, queers, transgender folk, Although Phyllis Schlafly and the rise of right-wing “family values” women caught our attention in the 1980s, many commentators seem to have forgotten about them, and are mystified by the fact that a majority of US white women voted for Donald Trump in 2016 and Roy Moore in 2017. Meanwhile, these folks have never been closer to power, from Jeff Sessions campaign for “religious freedom” from his perch as attorney general, a campaign to ensure that US law “will never demand that sincere [Christian] beliefs be abandoned,” even or especially if that means denying the right to contraception, birth control, non-heterosexual marriage, or, god forbid, for trans people to use the bathroom. Mike Pence has campaigned for “conversion therapy” for gay folks, an end to abortion rights for women, and has worked to eliminate maternity and prenatal care for poor folks through the failed Republican American Health Care Act and his work to stop Medicaid funding to Planned Parenthood. Betsy DeVos has begun the systematic transfer of education dollars from public schools to private and charter schools. A host of people at the Department of Health and Human Services have mounted campaigns insisting that birth control doesn’t work and most women who say they are raped are lying. This political formation, which was launched as anti-feminist and anti-gay, has deep alliances with racist ethno-nationalisms and free market fundamentalism. It is also a profoundly transnational project, traveling first with evangelical Christian missionaries in the Reagan and Bush ersa from Africa to Latin America, and subsequently through Catholic circles. Most famously, the person most associated with the Guatemalan genocide, Efrían Ríos Montt, was a pastor in the Church of the Word from Reagan’s California. The Ugandan “kill the gays bill,” the Anti-Homosexuality Act of 2014 was engineered by Massachusetts pastor Scott Lively of Abiding Truth Ministries, who has also been active in Latvia and Russia. These kinds of conservative Christian political formations followed the opposite trajectory as structural adjustment programs: from the United States to the region we used to call the third world. But in both instances, reproductive and kinship politics become economics and state policy. In a phrase, they’ve all become reproductive politics.